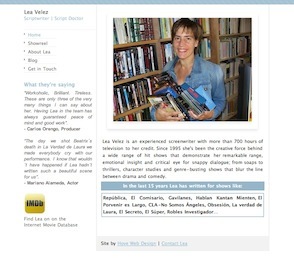 Here’s another new site for a screenwriter and script doctor based in Madrid, Spain. Lea wanted a simple site with plenty of white space to use as an electronic calling card for her work in the Spanish TV and film industry. We set up a showreel page with links to some her many videos on YouTube and added a blog that she can update herself. This allows her to have control over the content and keep the site fresh when it suits her, rather than having to keep coming back to us. It’s also more cost-effective to manage new content in this way.